It would be much easier, to resist this urge to write. I could hibernate and refuse to inspire, encourage, and grow a sport I love. To be safe from criticisms piled atop of my own criticisms. Why not quietly do what I love and leave social media alone? But I feel to do so, for me, would be to abandon another gift- the ability to put feelings in words, to encourage others to see through another's eyes. To abandon writing would be to abandon another love of mine. If I couldn't feel the emotional reprieve of running, the chapped lips, salt crusting around my hairline, watching laughter dance on a bluebird sky... If I can't be in that moment, I want to feel it, know it, yearn for it. Write it. Share it. Writing is (always has been) my first love. It was in words I experienced my first summit, first kiss, first death. I felt the trauma of loss and the playfulness of elation in fictional friends who never judged me, only taught. Friends who gave me a chance to discover myself by wearing different shoes. Books and authors and characters I spent my youth collecting like the miles I collect now, treasuring the differences in the pain and pleasure of each. To write, to create, wow! What a gift! What a mission! What a possibility! Why write? Well, why run? I am constantly tormented; being shy, introverted, and forgetful. Fearful of the spotlight and romanced by the idea of hiding behind words. Such a painful paradox then, the desire to give a hidden piece of myself writing. I'd rather let it alone. So much has been invested in me. My adventures, my passion, my joy are all the result of kindness, invested time, and graciousness of others. People who have removed my blinders and shown me possibilities, peace, and healing options for a troubled soul. If, in writing, I could give just a piece of that-- allow someone to, in a loose definition, "run" with me... if I can allow them to feel just a piece of that joy, peace, and reprieve available in our universe and spheres of lives; how can I be so selfish as to bottleneck this in? To inspire a single person to run a mile or appreciate a sunrise would be the greatest complement my writing could receive. I am not the best runner. I'm hardly any good at all! My times, which are mediocre at best, are not worthy as an inspiration to others. As hard as I've worked to come from the back of the pack forward, I lack any natural athletic talent to take me beyond where simple hard work and a sadistic pleasure in punishment can take me. But it doesn't matter. I love it; I thrive in the peace and fulfillment of a summit sunrise; the fulfillment that is only trumped by watching my children experience joy. If my passion annoys you, I'm sorry. My words offensive, please don't read them. I'd prefer to keep my personal experiences private anyways. We often can't feel the depth of a moment until it's a memory. This my attempt to give back, just a bit, for all the goodness life has given me. If this makes me a shameless self-promoter I am deeply, truly, sorry for the grievances I've caused by troubling your still waters. It is not my intent, and in general, no one is more disappointed in my shortcomings in personality, abilities, and overall flaws than myself. Where my own words are often inept in expressing the solitude and inspiration I feel radiating from our Wasatch, I wanted to share words that I retreat to often, that better capture the passion and longing. 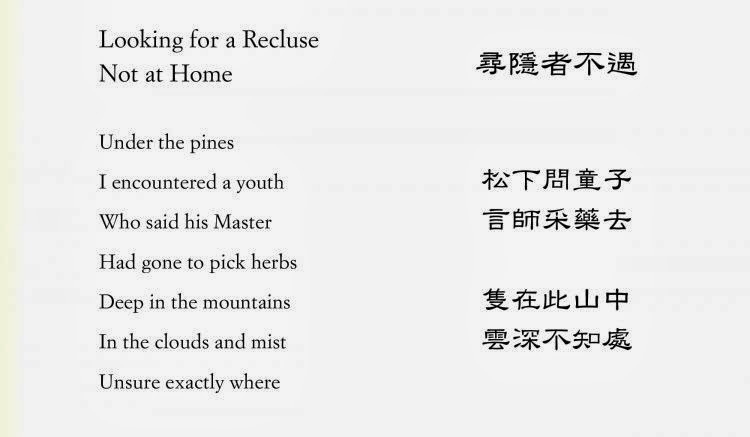 Here are two short Chinese poetry favorites. These poets are from the Tang dynasty. It's notable that in Chinese, the word "poem" is actually a compound character, translated literally is "word temple." Shameless! You should definitely keep it up - because you are awesome and your words are worth sharing! I think an answer to your entitled question is, "then so was Wordsworth, Yeats, and Dickinson." I'll take your running poetry any day of the week. And just so you know, you have inspired me in many positive ways--removing my self-imposed limits being only one.